I love it when I can produce a “wow” factor around food. “Wow” this is gorgeous, or “Wow” that tastes fantastic. 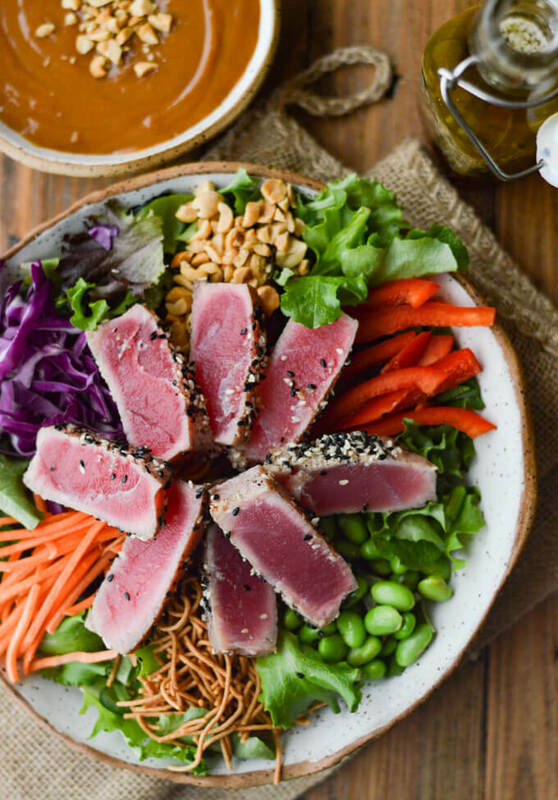 And I gotta tell ya, this Crunchy Asian Seared Tuna Salad with Peanut Sauce most definitely brings the “WOW!” in every way. The presentation is stunning with all the color and texture and the seared tuna is like butter that melts in your mouth. 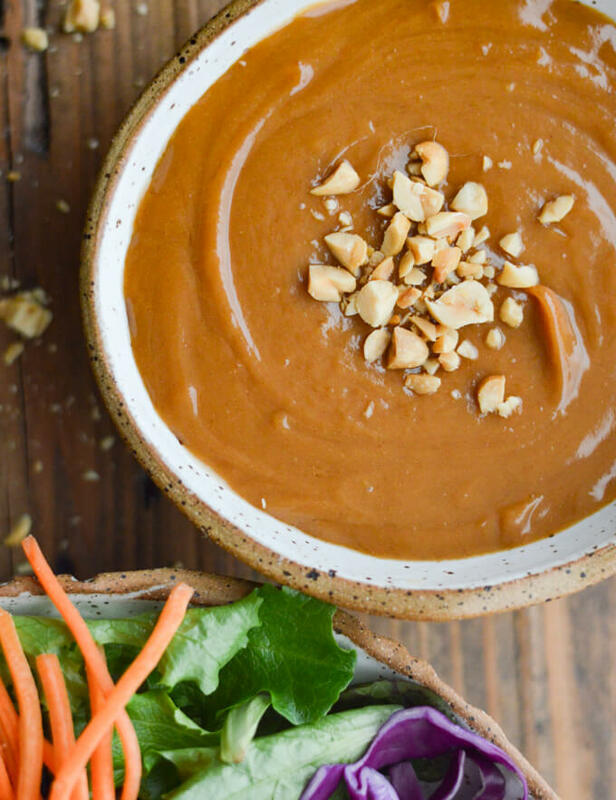 But the flavors that highlight this dish and bring it all together are the Asian salad dressing combined with the peanut sauce. As someone who loves to cook, I’m most gratified when I know that someone else will be enjoying whatever it is I’m preparing. Of course, I love to eat it myself, but the full satisfaction comes when I hear the oooh’s, ahhh’s, and mmmm’s around my table. It is like music to my ears. The heart and soul of any cook is the sheer delight of seeing someone else indulge in their food. Don’t be intimidated by the Ahi tuna steaks. They’re seriously one of the easiest and quickest things you can prepare. You will literally have it in and out of the cast iron pan in 2 minutes. When I first started making seared tuna, I was tempted to cook it longer which always resulted in a tough piece of fish. The trick is to heat the oil in the pan to almost smoking and add the tuna. Cook it on high for one minute, turn it over for one more minute and “Voila,” a perfectly seared piece of tuna that will melt in your mouth. The foundation of this salad is several handfuls of the springs greens mix. 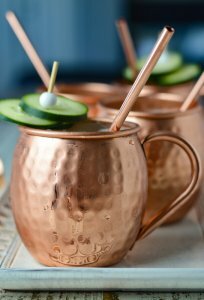 Of course, you could use any greens that you prefer, but I found this to be hearty enough to carry the weight of all the goodies on top. This package has a variety of greens that add to the overall appeal. And could it be any simpler? You open the bag and grab out what you need. They say (whoever “they” are), we eat with our eyes first and I wholeheartedly agree. You can toss all the ingredients together, but I love to design it as a colorful pinwheel with the red bell peppers, carrots, edamame, red cabbage, peanuts and rice noodles. All the colors and textures make this salad truly pop with excitement. Now, I’m ready to make the “wow” happen. It’s time to invite some friends over, serve this luscious salad with a light Rosé wine and watch the evening unfold in happiness. What could be better? 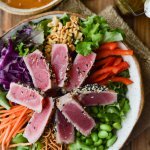 Crunchy Asian Seared Tuna Salad with Peanut Sauce is brimming with color, texture, and flavor. The tuna is like butter that melts in your mouth. 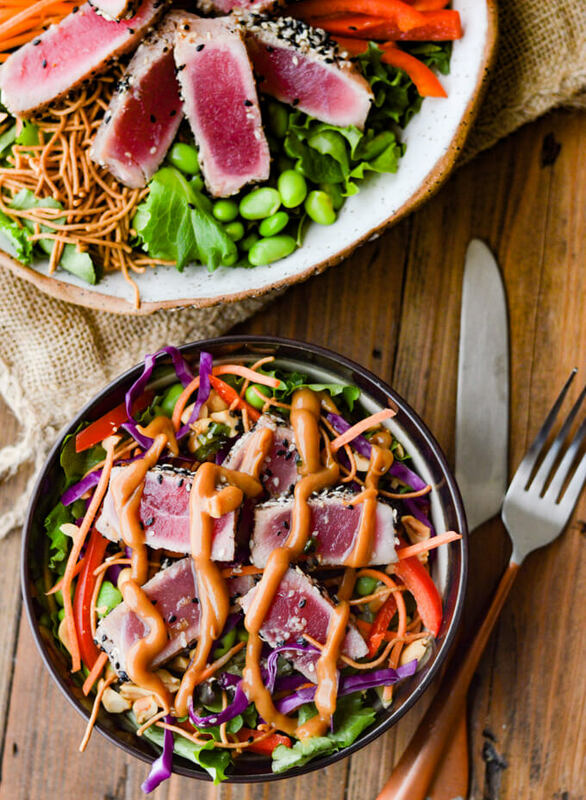 Asian Dressing and Peanut sauce top this salad with yumminess. Combine peanut butter, Teriyaki Sauce, and water in a medium size microwavable dish. Heat in the microwave on medium for about 1 minute. Whisk in the raw honey, hot sauce, and sesame oil. Set aside. In the food processor combine the rice vinegar, soy sauce, honey, ginger, garlic and lemon juice. Start the food processor and let it run as you slowly drizzle in the sesame oil and grapeseed oil. Remove to a small serving bowl and whisk in green onions and sesame seeds. 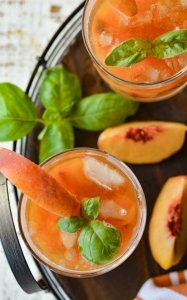 Serve Immediately or refrigerate up to a week. Coat the tuna steaks with olive oil and generously salt and pepper each. 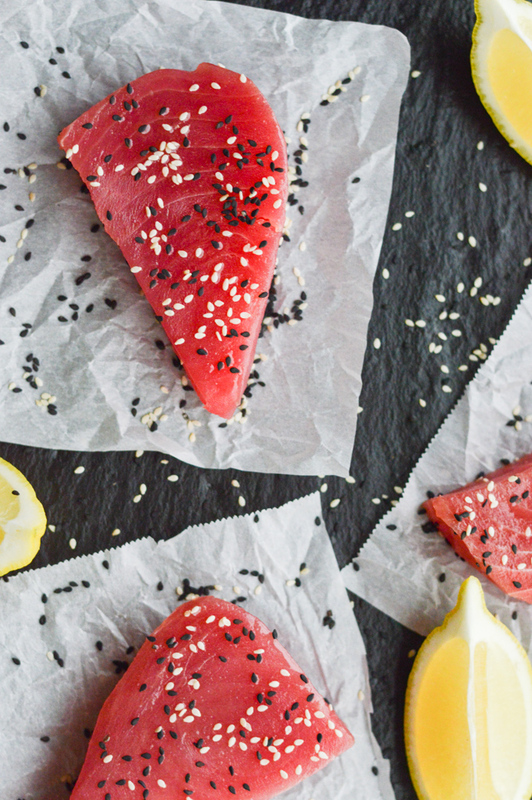 Combine the black and white sesame seeds in a saucer and coat top and bottom of tuna with the sesame seeds. Add the grapeseed oil to cover 1/2 inch of the bottom of a cast iron pan and heat over high heat until it begins to smoke. Add each tuna steak and cook for 1 minute. 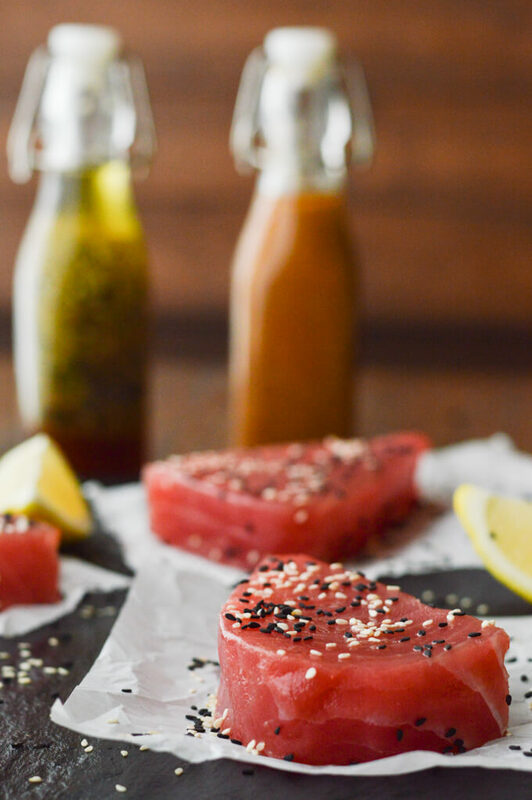 You will be tempted to cook it longer but the best way to sear tuna is very quickly. Turn and cook for 1 more minute and remove from the oil and let sit for a few minutes. Cut into 1/2 to 3/4 inch strips. In a salad serving bowl, add the spring mix salad. 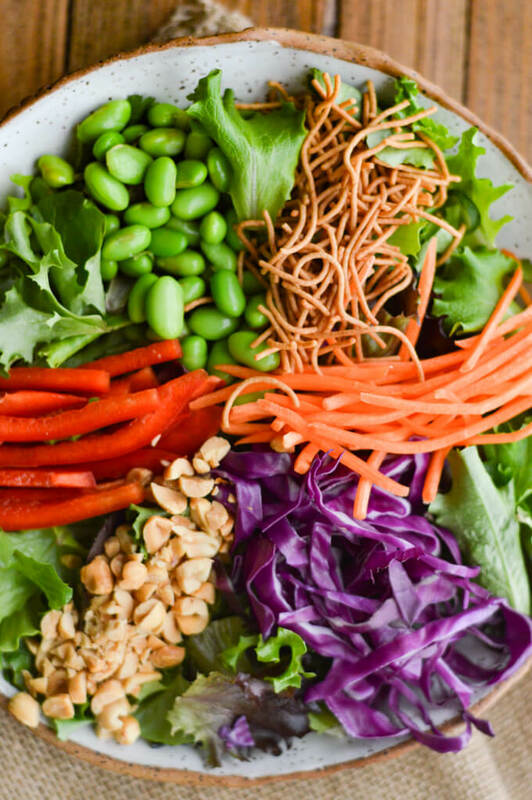 In a pinwheel design add the edamame, carrots, red cabbage, red pepper, peanuts and rice noodles. Serve with the Asian Vinaigrette and the Peanut Sauce. 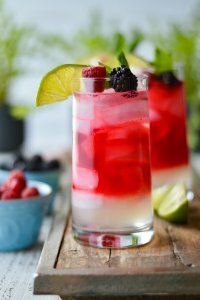 The combination of flavors in this recipe are amazing. Your photos turned out nice.